Finally friends after a lot of hard work and positive reinforcement. 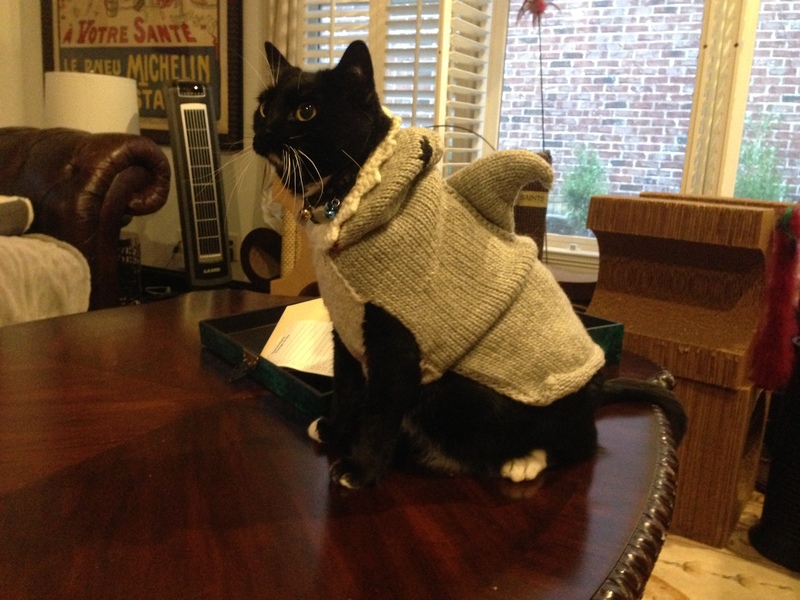 In her shark outfit...that is all. 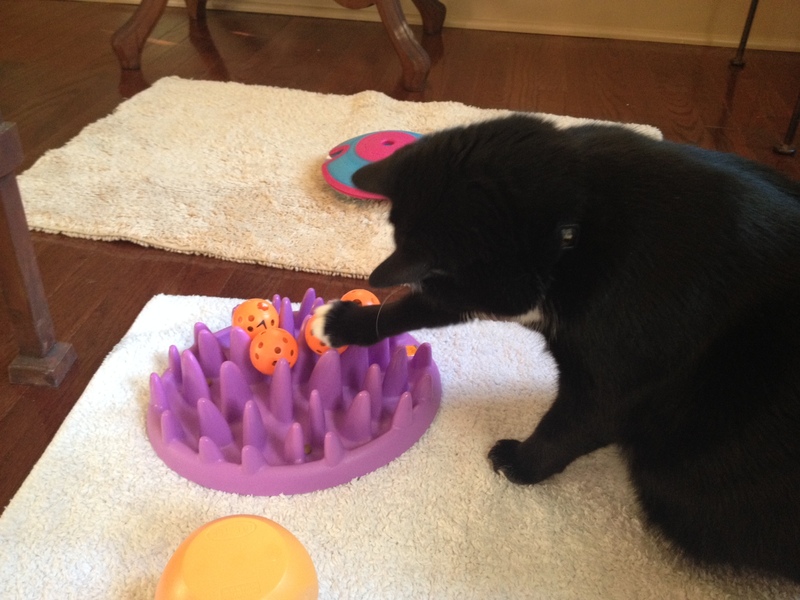 Voodoo with stuffed ping pong balls dropped into Catch toy for increased foraging challenge. She is a master forager! Jasper and Voodoo with their new Fundamentally Feline scratching post. Voodoo and Jasper together without attacking each other for the first time. 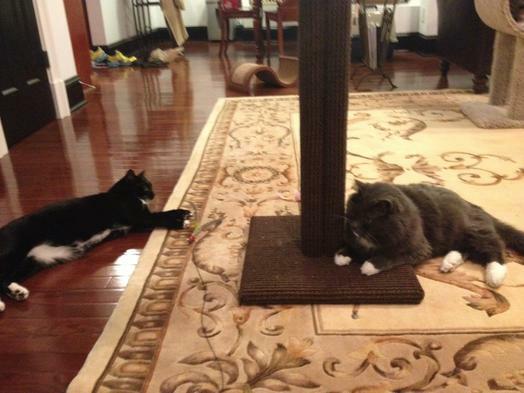 Notice the scratching post and the feather toy aiding in positively reinforcing this interaction! 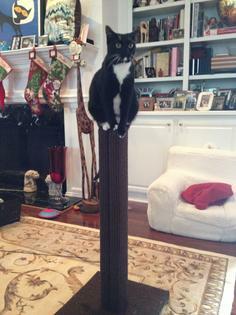 Voodoo on top of her new post! 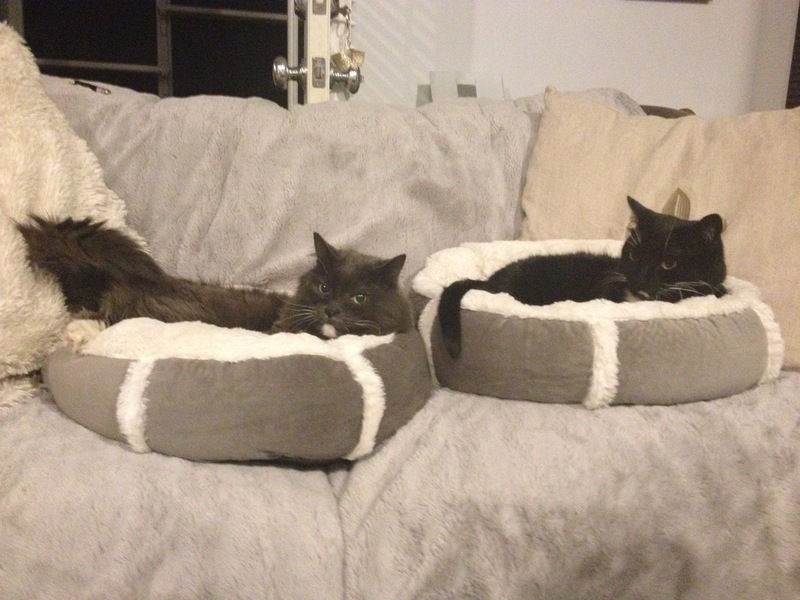 Being a lifelong cat person, I thought I knew what I was doing back in October when I decided to adopt a friend for my only cat – the first time I have ever tried to integrate a new cat with an existing cat. I quickly realized how little I knew! I was running myself ragged trying to juggle the demands of my feuding cats, even wondering if we would have to return our newest cat to the shelter, which would have broken my heart. I was talking to my brother one day about World War C(at) and he told me about Jackson Galaxy’s program, so I decided to search for help online. Luckily I found Ingrid… She was wonderful about working with my crazy schedule, came over and spent several hours with us, taking in all of the dynamics. Within a week of her visit, things were changing. We are now about two months in and the only word I can use is MIRACLE. I am so grateful for Ingrid for making my life better, for making my cats happier, and for being truly devoted to the well being of cats. As an added bonus, my kitties absolutely love their scratching posts. My big boy Jasper climbs his it like King Kong on the Empire State Building and the little girl Voodoo sits atop of hers like a bulb on top of a lamp post. They love them! Ingrid has made such a difference in our lives. Truly the best money ever spent!